Blogging on Bloggers: some brilliant posts from Sanscrito e civiltà dell'India the Italian Indology blog by Giacomo Benedetti. Giacomo Benedetti the indologist who is changing the face of Indology also has some great posts in his Italian blog, here i post few of them with the help of Google Translate. In the great book by Bernard Sergent Les Indo-Européens is also a chapter on the games, which starts from nuts , called "the game far better attested in Indo-European cultures, and with such frequency and such an expansion that can not rest on a common heritage. " It is noted that this was in ancient Greece, Macedonia, India, Iran, at the Germans, in Lydia, in Rome, and that in almost all these peoples had the utmost importance. 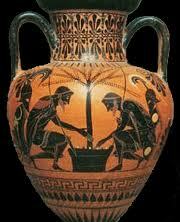 In Greece, the game is frequently referred in the literature. In Lydia, he attributed the invention: according to Herodotus (I.94), during a famine would the Lydians invented the game of dice, the knuckle, the ball, and so on (all except chess) a day to forget hunger on two. Finally, a party would have emigrated to Italy under the guidance of the Tyrrhenian Sea, to become the Etruscans. Located in Rome, continues Sergent, a legend arose the origin of the founder of the city in a game of dice between the priest of Hercules and his God. Among the Germans, Tacitus tells us (Germany 24), we played with such earnestness and perseverance, that when he had lost all that he had, he would like placed their freedom, reducing slaves in case of defeat. 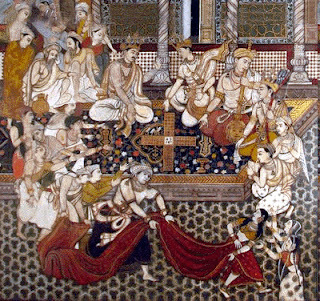 Something similar happens to Yudhisthira, the king of the Pandavas in the great Indian epic, Mahābhārata, where in a game of dice he brings into play the kingdom, his brothers, himself and his wife (see illustration above ,taken from a Persian manuscript). Again RV. X.34, the famous 'lament of the player' in str.4 mentions the player tied taken away as a slave. In Greece, the game needed to divination, the same at the Balti ancient divination in medical, and an ancient Indian text, without specifying Sergent says, describing an oracle achieved by means of nuts. Even the priests of the Slavic tribe of Retrani were oracles with nuts (and horses). The dice game looks like a game in Macedonia and in the royal Achaemenid Persia, as it was in India, where it was so important that the epochs of history are named after the dice points: Kali, the worst point, gives its name to our degenerate age. But what is the meaning of Kali ? The Dictionary of Monier Williams gives as the first just what the 'nut or nut side marked with a dot, the nut loser'. The dictionary poles of the Pali Text Society gives 'the nut unfortunate, unlucky throw a dice, bad luck, demerit, sin, sinful, sinner, saliva, spit'. These meanings in the poles, which was closer to the spoken language than Sanskrit, suggest a concept of bad luck and impurities, which has been identified with the nut loser of the game with walnuts Vibh Ithaca, from the tree Terminalia Bellerica , considered as infested by demons. If we consider that the dice were probably originally used for divination, and that the odd number of 'fate' (including nuts) was associated with bad luck (see here ), this interpretation acquires even more verisimilitude. The term kali can be etymologically traced back to the darkness and impurity: kalana means 'stain, blemish'; Kalanka 'spot, sign, dirt, slander';kaluṣa 'murky, disgusting, unclean, dirty, dirt, impurity and sin' , kalka 'dirt, impurity, falsehood, deceit, sin', and, incidentally, also designates the Terminalia Bellerica. A parallel one person you might also find in greek Kelis 'spot, shame, shame', Latin caligo 'darkness', and calumnia . 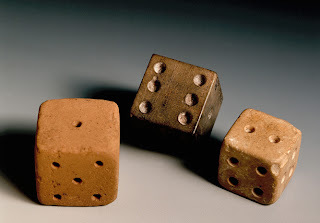 But the most interesting comparison is with the name given to the score of the dice down in Latin, or canis or canicula , and in greek, Kyon , which always means 'dog'. He even found a nut, in Taranto, with written ky (on) instead of either ace, reproduced here. Now, back in Rgveda if a player was victorious and expert said śvaghnin 'killer of dogs or dog', which, comparing it with the greek-roman language, it could mean that he was able to avoid unlucky shots. Apparently the dog, probably as unfortunate animal was associated with loss in the nuts. In Satapatha Brahmana XIV.1.1.31 it, along black bird (the crow), is identified with falsehood ( anṛta, the opposite of the RTA , the Truth-Order), with darkness and evil ( pāpman , which also means bad luck or sin). In Taittiriya Brahmana III.4, in the great ritual of horse sacrifice, it requires the killing of a dog 'from the four eyes', as it is explained, the dog is evil ( SVA Go Papma VAT ). What is this dog is discussed in the ' article by David Gordon White 'Dogs Die'. A p.285, note that this is usually explained as a dog with white spots above the eyes.A note to Satapatha XIII.1.2.9 Brahmana says, however, that such a dog was just a substitute for a dog with two faces (rare anomaly but not impossible). White, however, also cites a passage of the Avesta about a funeral rite in which you use a dog with four eyes, which according to dictionaries Avesta indicates a dog with two spots above the eyes. The significant thing is that even the hell hounds of Yama have four eyes, as in RV. X.14.10-11 . Perhaps here too it is understood that they have two faces, similar to Cerberus greek? Could confirm the comparison with RV. X.99.6 , where we find a demon 'with six eyes and three heads', a description which is also found in the Avesta, Yn. 9.8, for the dragon A ž the Dahaka. However, there is a strong affinity between Cerberus and the dogs of Yama is recommended, in addition to the role as guardians of the dead, etymology: the greek Kerberos is the name of the Vedic one or both dogs: Sabala , which means 'variegated, spotted, stained'. At first glance, the correspondence may seem dubious, yet we have a number of terms in ancient Indian who approach very closely to the greek term, including karbara , which always means 'variegated, spotted', and is also the name of a demon. A very interesting aspect is that these variants of the same adjective (to be added karvara, karbura, Kavara ) reveal the existence of forms centum next to those, normal to the ancient Indian type satem (in addition to Sabala, Savala, Sabara and SAVARA ). The thing, however, should not appear unheard of, since even in the language Himalayan Bangani are forms centum . Remarkable that, like other forms centum in ancient India, it is attested in terms of post-Vedic works or even in lexicons, as if the satemization was a phenomenon typical of the Vedic language, which was closer to Iranian with which it shares this evolution while isolated areas far from the original Vedic region (northwestern India and the Indus valley) may have developed forms centum closer to proto-indo-european, parallel to the Greek form. Which, for its part, appears to be an archaic residue, now incomprehensible to the Greeks themselves (see here), as handed down the names of the gods. About archeology, according to a website dedicated to games, the first nut cubic identified dates from the late fifth millennium BC in Syria, which should not be connected with Indo-European civilization. Sergent, who has published the text in 1995, tells us that the earliest dice in the world amounted to Altyn Tepe, Turkmenistan, towards the end of the fourth millennium, but I have not found confirmation of this information. Looking into the network (see here ), the most widespread notion seems to be that Shahr-i-Sokhta, in southeastern Iran (Seistan) and the site of the discovery of the earliest dice, attributed to 3000 BC (but this does not seem to have precise references) and cubic (see here ). At the same site, they found dice with rectangular pieces and chessboard, in a tomb of the period III (2500-2300 BC), as reported in the book Vidale, already mentioned in another post , on the east of Sumer , pp.94- 95. 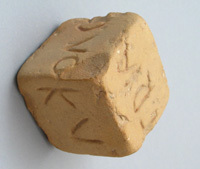 Even in the Harappan sites are located in both cubic dice (such as those in the picture above) and rectangular with sides numbered 4, and the rectangular type also appears to Gonur Depe in Margiana (see here ), in the period Namazga V (2500-2000 BC ), where they are considered as imports from the Indus civilization. It's interesting that the Harappan cubical dice have two variants (as reported in this book ): some have, unlike our, 6 opposed to 5, and 1, as can be seen also in the picture, but another one of those Harappa has the numbering as modern ones, and (in part) greek-Roman. A Swedish study also shows the frequency of these items: a discovery out of ten at Mohenjo-daro is linked to games, and with a spatial distribution that suggests places dedicated, those who were called in India historic Sabhā . But the object that struck me most in the collection (not for the aesthetic value) you can see in this display case. And then, the supposed arrival of the Aryans with their chariots and horses from the Eurasian steppes to India and Iran would prove not only once more a myth, but a reversal of history (of similar reversals, and Sintashta like receptor pulse from Central Asia South Asia, if not actual colony Bactrian Bronze Age, see the last post in New Indology). Also note the zebu left: animals of South Asian descent, already domesticated in the Neolithic Mehrgarh, spread in Central Asia at least at that time, reaching Azerbaijan, Mesopotamia, Anatolia, and perhaps the Ukraine ( see this other post of New Indology).